The Scajaquada Express (aka NYS 198) has been in the news a lot in the last few years. Everyone has a lot of opinions on the road and what it should look like – whether to remain an expressway, be downgraded to a parkway, etc. Of course, the expressway takes its name from the creek along who’s route it follows. Did you know that in addition to the creek, there is also a second Scajaquada Street in Buffalo? Scajaquada Street runs between Bailey Avenue and Grider Street on the east side of Buffalo, cut into two pieces by railroad tracks. Scajaquada is the type of word that Buffalonians know, but the kind of word that immediately stumps out-of-towners, a relic of our Native American roots here in Western New York. Both the street and the expressway get their names from Scajaquada Creek. Did you know that Scajaquada Creek was named after a person? The creek is named after Philip Conjockety. His name was also spelled Kenjockety. He was also known as Ska-dyoh-gwa-deh (meaning “Beyond the Multitude”), which was also spelled Skandauchguaty or Conjaquady. There are estimated to be as many as 90 different spellings of the word. No wonder we still have trouble spelling the word today! (One of my favorite Buffalo jokes: How do you spell Scajaquada? “198”) The Seneca name was commonly Ga-noh-gwaht-geh, meaning “after a peculiar kind of wild grass that grew near its borders”. The grass was important to early settlers, because it was used to create woven baskets, fishing nets, and supplies. Philip had come to Buffalo with the Senecas shortly after the Revolutionary War, when they were driven away from the Genesee Valley. Philip’s great grandfather was a member of the Kah-kwahs, who once lived in the Western New York area. The Kah-kwahs were overtaken by the more powerful Senecas around 1651, and the survivors were adopted into the Seneca nation. 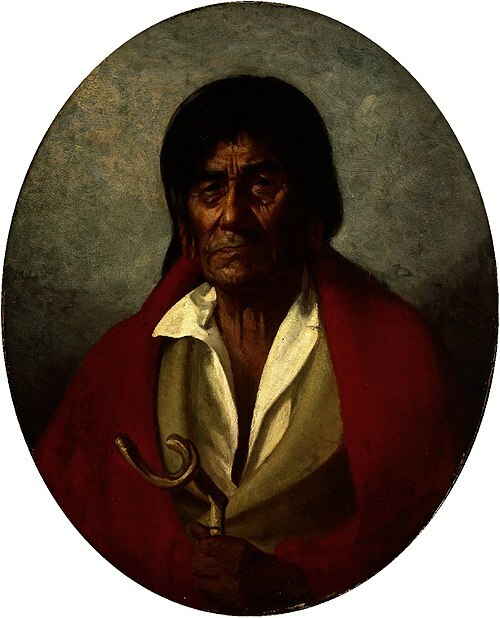 Philip’s father, John, became Chief of the Seneca, and was part of the influence which brought the Seneca Nation to the banks of the Niagara River near what became Scajaquada Creek when they left the Genesee Valley. Philip was born near the Tonawanda Reservation and lived in Fort George during the Revolutionary War, when he fought with the Senecas against the Americans. Philip died April 1, 1866, at Newtown, on the Cattaraugus Reservation. When he died, the Courier reported at the time that he was the oldest resident of the region. Some accounts listed him as 120 to 130 years old, but it was generally believed that he was nearly 100 when he died. His mind was clear in his old age, so much of the early history of Buffalo was gathered from Philip’s stories. During the War of 1812, the navy yard at the mouth of Scajaquada Creek was where five of Commodore Perry’s ships were reconditioned during 1813. A plaque commemorating this location of this navy yard is on the Niagara Street Bridge, north of Forest Ave. On South Side of the creek near its mouth was Sailor’s Battery – the last in a line of 8 batteries stretching from the Terrace to the Creek that helped defend during the War of 1812. The Sailor’s Battery was the first to be overtaken during the night of December 29, 1813 during the Battle of Black Rock which led to the Burning of Buffalo. The Battle of Scajaquada Bridge was fought August 3, 1814. British forces were attacked by American forces at the bridge, west of where Niagara Street crosses the creek. The American forces were entrenched on the south side of the creek and began to dismantle the bridge to prevent the British from crossing. The British attempted to rebuild the bridge, but failed and ended up retreating to Canada. The outnumbered American men were able to stand up to the British men in what was the last act of British aggression towards Buffalo during the war. The victory is described as a decisive engagement and a triumph for the United States. In 1899, the National Motor Transit Company entered into a 1 year contract with the Park Board of Buffalo to operate an automobile transit service to travel along what would become, 60 years later, the route of the City’s first intra-urban highway, the Scajaquada Creek Expressway. Four cars traveled from Lincoln Parkway past the zoo to Humboldt Parkway and Main Street every half hour. Around 1946, New York State began planning for a system of highways throughout the City of Buffalo in a report titled Report on the New York State Thruway and Arterial Routes in the Buffalo Urban Area. In 1951, the Buffalo Planning Commission adopted a Major Traffic Ways Plan that included the Scajaquada Expressway as a component of the system. Traffic was quickly growing within the City and the highways were designed to find a place for the cars by channeling them onto expressways. The Scajaquada Expressway was constructed during the 1950s and 1960s. The route was designated by the Surface Transportation Act of 1982 as NYS Route 198. Other plans to create a second limited access highway was proposed for Delaware Park in 1958. The “Delaware Park Shortway” would have run parallel to 198 across the north side of the Delaware Park meadow. The City Planning board tabled the proposal in order to finish construction of the Scajaquada and Kensington Expressways to be completed before the Shortway was built, so plans never came to fruition. Studies have been going on since the late 1990s regarding downgrading and/or removal of the Scajaquada Expressway, particularly the section through Delaware Park. Historically, Scajaquada Creek was a shallow, wide, meandering creek. Over time, the creek was channelized and portions were routed underground in three ares. Residents would use the creek to dump their waste, creating a public health issue in the stagnant water. Putting the creek underground would help resolve this issue, and created numerous pocket parks along the former length of the creek. The largest tunnel was created as the Scajaquada Drain project in 1928. This project buried 3.5 miles of the creek, from Pine Ridge Road to Forest Lawn Cemetery. A portion of the buried creek runs under Scajaquada Street. Top photo 1924. Bottom photo modern image same site. Corner Scajaquada Street and Kilhoffer during construction of Scajaquada Drain. Source: WNY Heritage. During the 1930s, the sewer systems crossing the creek were disconnected, connected the creek into the city’s combined sewer overflow system. The Delevan Drain was built to try to divert the combined sewage near Main Street, but it is designed to function during low flows, and during storm events or high flows, the water exits the Delevan tunnel and flows into the stream channel. At Forest Lawn Cemetery, the creek is recharged by underground springs, and the Onondaga Escarpment creates Serenity Falls within the Cemetery. When Delaware Park was originally designed, the 42 aces lake was formed by damming Scajaquada Creek. As part of the Expressway construction, park, portions of the lake were filled. The lake retains little of its original shoreline. 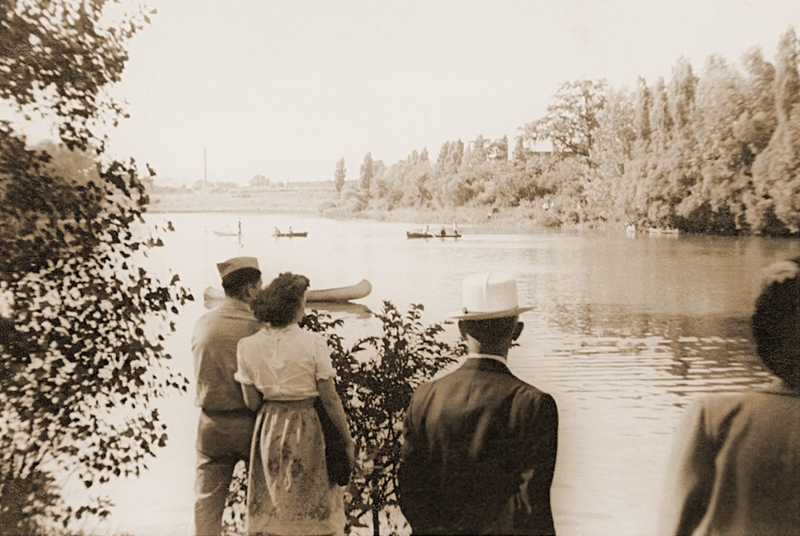 During the 1950s, the lake was declared by the Department of Health a health hazard and was closed to the public due to the sewage overflow issues. The creek was rerouted to separate it from the lake in the early 1980s. Buffalo Niagara Riverkeeper and other organizations are working to restore and provide environmental restoration to the creek. So the next time you drive over the Scajaquada, think of Philip Konjockety, a highway that were never built, and a creek that’s been buried. To learn about other streets, check out the street index. Carstens, Patrick Richard and Timothy L. Sanford. Searching for the Forgotten War – 1812. Xlibris Corporation: 2012. “Death of Philip Kenjockety”. Courier & Republic. Wednesday Evening, April 4, 1866. Delaware Park Shortway. Courier Express. September 5, 1958. Pg 6. Cichon, Steve. The Buffalo You Should Know: The Slow Death of Humboldt Parkway in Building the 33 & 198. Buffalo News. May 8, 2016. Treasure at the Dump. The Illustrated Buffalo Express. 1902. Could you explain the paragraph that states… “Philip was born near the Tonawanda Reservation and lived in Fort George during the Revolutionary War, when he fought with the Senecas against the Americans.”? Do you mean that he was born at what later became the Tonawanda Reservation? Then lived at Fort Niagara during the American Revolution? Fort George was in Canada opposite Fort Niagara. The Senecas sided with the British during the war. Thank you for sharing this interesting local history. Learned a lot from the article.